April 11, 2019: When Philippe Cassegrain created Le Pliage® by Longchamp back in 1993, he was inspired by the ancient Japanese art of origami. 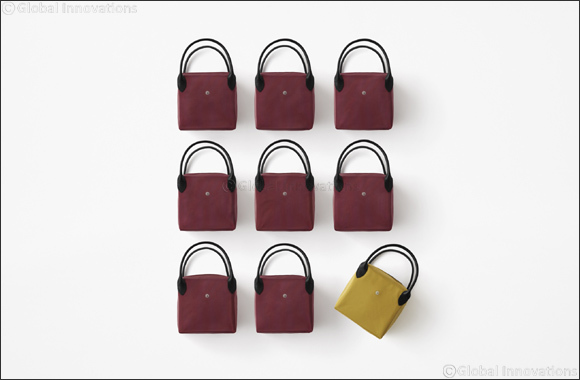 Now a new collaboration, initiated by the next generation of Longchamp’s founding family, brings the iconic foldable bag full circle, as it is reinterpreted by the Tokyo-based design studio nendo. Nendo, which was founded in 2002 by Oki Sato, aims to create designs that generate what it calls “!” moments in everyday life. Its philosophy is based on reshaping everyday objects to make us look at them afresh, thus enriching our daily lives and experience. This ethos is clearly demonstrated by its intriguing reinterpretations of Le Pliage®, which reveal this instantly recognizable object in an entirely new light. While the classic Le Pliage® offers two distinct experiences – one when it is carried as a bag, the other when it is folded away – nendo’s designs introduce a third experience, reimagining the bags as functional, aesthetically pleasing storage objects to be placed around the home. There are three variations on the theme, all exquisitely simple in shape and sophisticated in execution. The first is a bag which – thanks to a removable, foldable stiffener – transforms not only into a cube that can be used for storage or transport, but also into a sturdy and spacious wide-bottomed holdall. The second is a cone- shaped bag with a single handle by which it can be either carried or hung from a hook or rail. Its leather top – referencing the signature flap of Le Pliage® – opens easily to allow objects to be put in or taken out. The third is a circular bag inspired by traditional furoshiki folding cloths, which were widely used in Japan to carry objects before the popularization of Western-style bags. Like the furoshiki, it adapts to whatever it carries, resulting in total flexibility of function. The cone and circle bags come in two sizes, and the cube bag in three, in a palette of six shades which Sophie Delafontaine describes as “coloured neutrals”. Options including pale grey, dark blue, mustard and burgundy, with white or black trim, strike an elegant balance between nendo’s predominantly monochrome aesthetic and the paint-box brights of Le Pliage®. The cone bag is also available as a limited edition in supple black lambskin, which nods to the classic Le Pliage® Cuir.